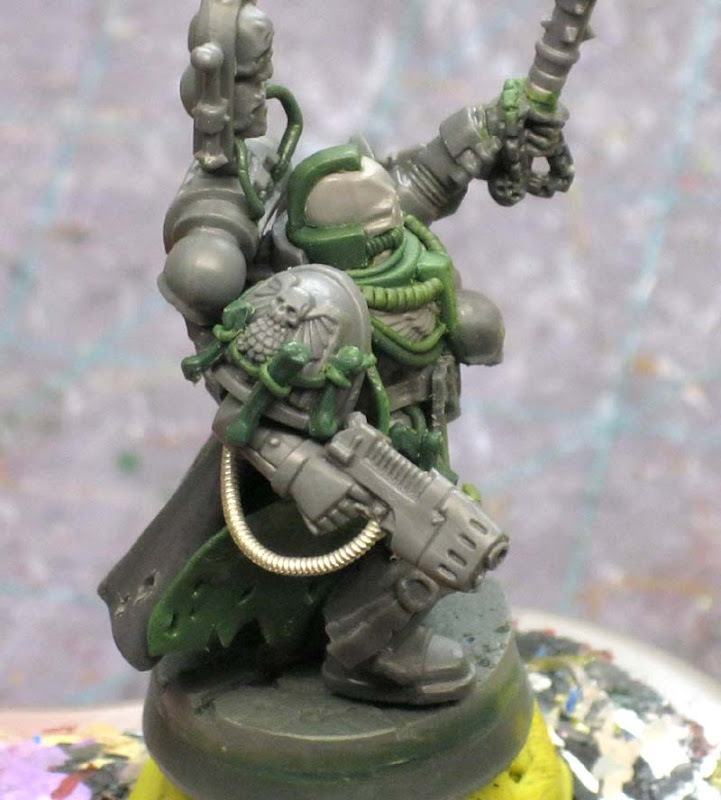 I picked this Chaplain conversion project up a while ago and just recently finished building it. I won't be painting the model, just building it for my Client. The idea was to match the GW artwork there on the right. Part of "matching" a model is the pose and part of it is the feeling of the model. While I don't have tons of WIP shots, I'm going to try and break the construction down into the key things I had to overcome while converting this model. The first hurdle was getting something I could use for the pose. 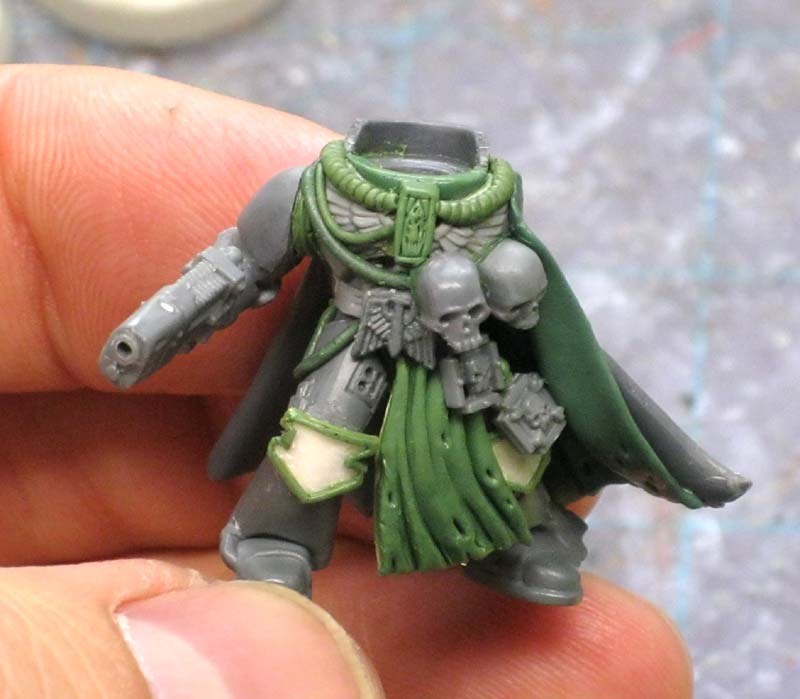 I went with my initial impression and used the Space Marine Commander torso and cape for this model. The pose for the Commander is very iconic so an additional problem was going to be trying to mask the easily recognized set of legs with attached cape. Starting with the legs, I had to do a couple of things to them. I cut the knees down to accommodate the new knee pads over them. I wanted to capture the shape of the kneepads in the artwork. If nothing else, it really helps set him apart as wearing custom armour. The knee pads are nothing more than thin pieces of cardstock that are cut to fit in the new shape and glued in place. They are given a coat of superglue to harden them so that I could add the greenstuff trim around the edges later on. After that, I needed to sculpt a half tabard in the front. I've done this a dozen times and I've got a preferred method for getting this done. Here's the step by step process I used to sculpt the half tabard. The crozius proved to be easier than I thought in the end. It turned out to be a collection of the "right" bits that needed to be assembled. The arm is a Black Templar arm that was originally holding a powersword. I wanted it for the chains. The middle portion is from a Chaos Terminator mace. I used it for the bulk of the weapon to give it some length and it had a few spikes on it too. The top part is from a Sergeant banner. It matched the artwork closest so I found a way to cut it from the banner, trim the bottom edge and attach it on top. All the individual parts are pinned together for added strength. Once it was built, I had to go in and fill some tiny gaps with greenstuff and resculpt the chains where they came over the top of the wrist as I'd cut them away getting a level surface to build the weapon on originally. As I moved up the model, I had a number of elements to add to the chest. There was the box type thing in the center with a pair of power cables running to it, the skulls draped across the front and a few things attached to his waist. The first thing I did was add a bit of height to his collar. After that, I added the central box shape to his chest plate. I used this as a reference to build outwards from with the cables and such. It's not an absolute exact match for the artwork, but it's close enough I think to get the feeling across. When you scale an image down, sometimes you need to remove some elements just so the model is still "readable." A big test for me with this model was the inner robes. The ones that he's wearing over his arms that fall under his shoulderpads. Most of the time, this "problem" is avoided by changing the position of the cloak or hiding it elsewhere. Unfortunately, the model shows this prominently. I really had no idea how I was going to do it when I took the project on. I figured I could sculpt them in place similar to how I sculpt half tabards if I did not come up with anything else. 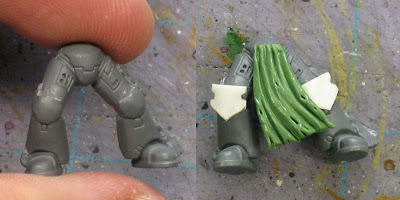 I've actually sculpted a full cape before using the half-tabard method, but it can be very time consuming to get a nice effect. Very, very time consuming with the extra steps needed to make it work. Hoping I wouldn't have to go this route, I decided to try the approach where you roll a piece of greenstuff out flat, cut it to a rough shape and then position it on the model in the flowing manner you think works best. It sounds easy. The reality is much different. You have to be careful of a number of things if you decide to go this route. More than that, you really do need to be patient. If you can get a good estimate of the shape you'll be needing and can cut it out in the beginning, that can make a huge difference. Also, hiding the cape behind another element can help. I managed to be able to tuck this one behind the plastic one on the model already. That meant I'd only have to sculpt the visible ends on each side and not the whole thing. A huge difference in both work and time. In this case, I had to make sure I did not affect the positioning of the arms either. On top of that I had to give it a tattered look. In the end, I think this really makes the model what it is. It gives him bulk, it gives him a really unique look and it matches the artwork. One of the big things (well small) were all the bones/skulls this guy had draped on his body. He's got them on his right leg, right shoulderpad chest... they're everywhere. There was no way getting around them. I ended up making them (my bones) separately, letting them cure and then gluing them in place over a prepositioned length of greenstuff. Then after adding each bone, I added a bit more greenstuff "rope" to show how they were attached. 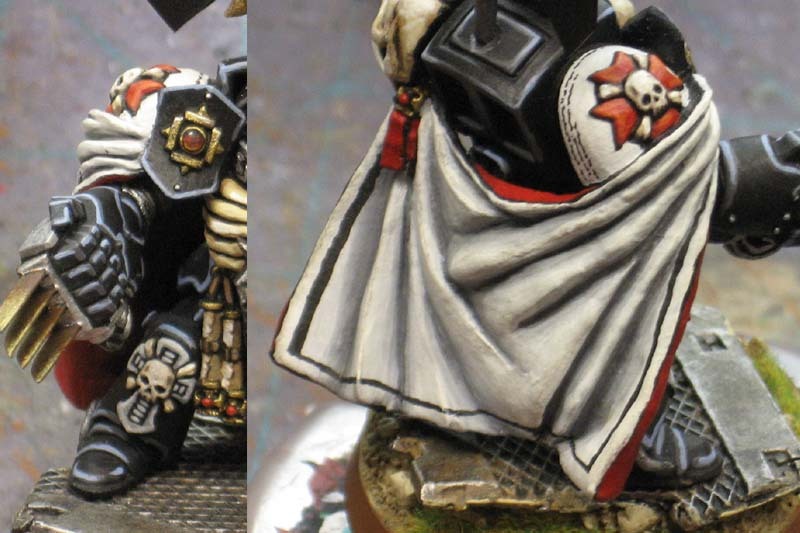 You can see how the power armoured Chaplain skull helmet fits nice and snug into the collar area in the shot above. You can also see the power cable I added for the plasma pistol which comes from Dragon Forge. I opted to leave it (the power cable) off the crozius in favor of the chains I added to his left hand. The chains give him a more Black Templar feel I think. I actually used a few methods to get the power cables on this guy and have a more in-depth look at the options available for sculpting power cables that can be seen here. I'll say that the Dragon Forge cables are the way to go if you're connecting things and the cable will be hanging there... but if I'm adding one to a surface, I prefer the greenstuff method much more. And last but not least, the finished model. I went through my collection of bases and found an Urban Street themed base from Secret Weapon Minis to mount this guy on. I wanted to add a subtle texture that was less organic and ran counter to the flow of the model. I found one of the 25mm ones that fit the bill perfectly. My jaw dropped at the finished product. I think this is my new favorite conversion of yours. Fantastic work! How did you do the small "rim" around the knee pads; roll out a thin line of GS and fit into place? Thanks guys, he's one of my favorites now as well. He's got so much life to him I think. RealGenius: Yes, that's close. It's actually easier to cover the entire thing with a thin layer of GS, trim away the excess around the outside edge and then cut out the middle. That way you get a consistent thickness to the edging and you an adjust it as you go. It is an awesome convertion, I love it. That is pretty amazing stuff Ron. I think you've captured the spirit of the picture really well. Ace. this is absolutely stunning, beyond breathtaking and just astoundingly haunting. Wow, you really brought him to life... thank you for sharing- he's just magnificent. You are making plastic as handsome as metal. Very good! Absolutely awesome and so full of win! Thanks for sharing your thought process. Epic WIN! 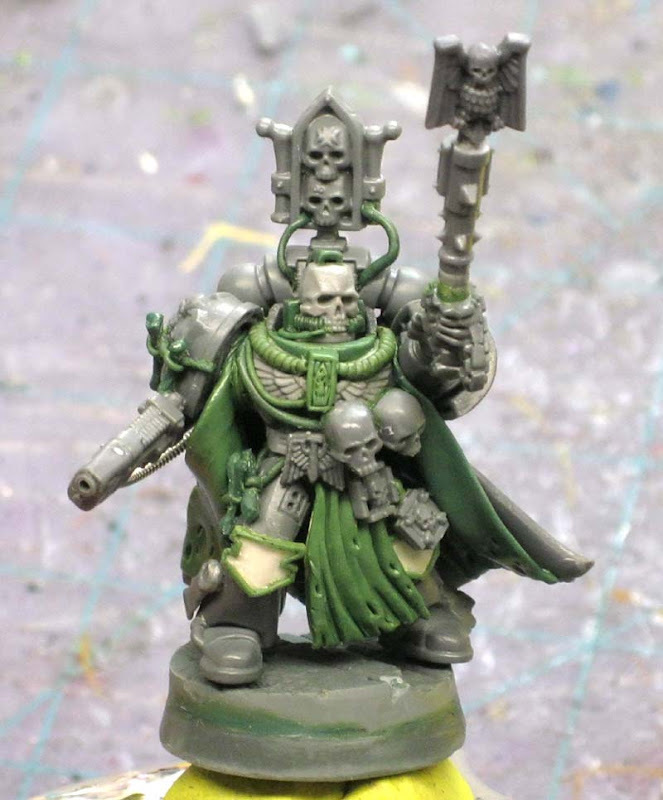 That is positively the coolest chaplain build I've ever seen. Marshal Wilhelm: The cover of the BT Codex has great potential. 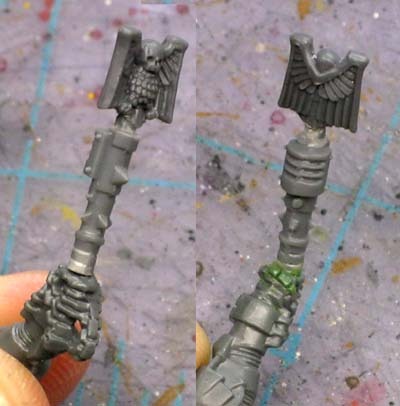 It's a pose (the two handed weapon grip) that we're seeing much more of now that Grey Knights are out. I'm working on a Custode model now that is along the same lines. davetaylor: Thanks. My model for Heroes of Armageddon is metal, but I'm hoping to include a little more dynamic flow to the banner he's holding like I did in the robes here. oni: I think this is the closest I've come to getting the feeling of a Chaplain model so far. Great conversion work there to create a really unique looking model - love it! Impressive work! Question: what puddy do you use? Do you have a product review on different puddies? I'm beginning to do more and more sculpting and green stuff seems fine but it gets a little sticky sometimes. Is impressive how everything fits perfectly. 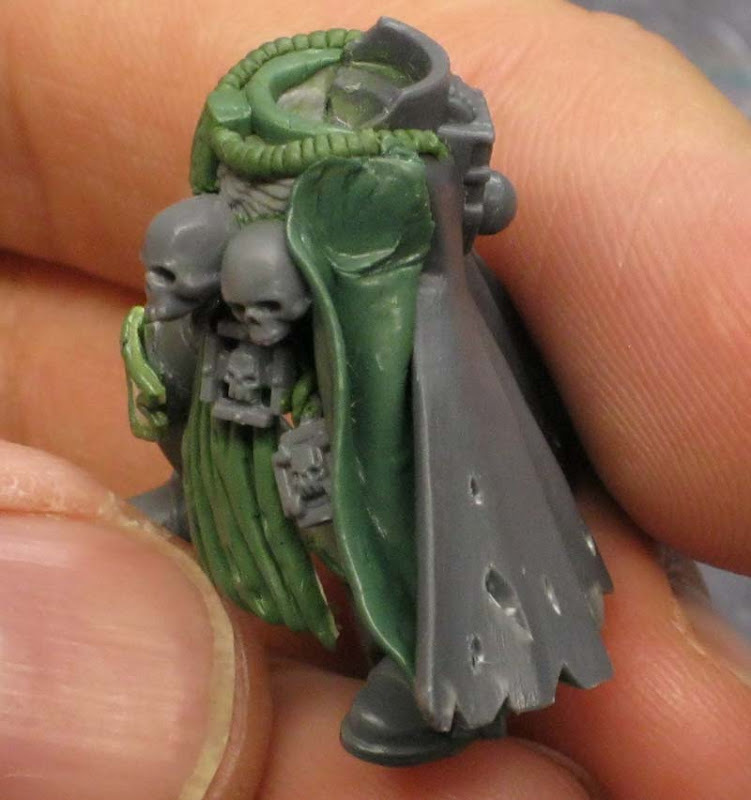 This is one of my favourite conversion of yours along with shrike and vulkan. 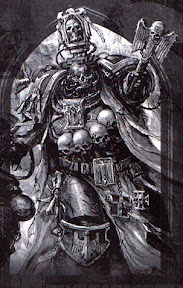 Oh, and I like the artwork too (Raven Guard Chaplain, you know). Old Shatter Hands: I use greenstuff for 99.9 percent of my work. The only time I don't is when I am doing larger scale base work and I don't want to use a ton of GS to cover a lot of bases. Grajo: I did not know that. Once again, I'm in awe of your skills. Well done squire. I have only one thing to say to this. Even having read all of your tutorials, I wish I had HALF your greenstuffing skill. Another work of art. Thank you for sharing your process! How do apply the super glue to the cardstock? Do you use a brush? What type of superglue do you use? I prefer the gel type when gluing figures, but for coating something you may want something thinner. ariandynas: I'm self taught really when it comes to GS. It's lots of practice and starting out small with simple shapes. Kind of like painting freehand. You build with simple shapes to get the complex stuff. Jason Gross: It's a thin superglue as opposed to a gel type. This is more water in its consistency and I apply a drop here and there until the whole thing (the cardstock piece) has absorbed the superglue. If the surface of the cardstock is going to be visible as it is in this case, I am careful how much I apply. Just enough to coat it... much more and you create unwanted surface texture. Thanks for the response! I'll definately be trying that technique. This absolutely captures the feel of a chaplain and is an astoundingly beautiful model. Thank you for your hard work and sharing this! It's incredible, inspiring work. Jason: Make sure to let me know how it goes. I just finished a Custode model where I used my "watery" superglue to coat purity seal ribbons and cure some cardstock for a tabard. Both techniques on the same model. Thanks Pastafarion. I like to think I was able to capture the "feel" of the model as much as or maybe more than the actual look of it. Needless to say, that is awesome. Thanks. Turns out, it's one of my more popular conversions to date... who knew? Do you have any photos of this model painted? Reid: Unfortunately not, the commission was only to build him. Really nice, but I'd have used mark 6 greaves as basis. Madness: Thanks, the different style greaves are definitely a possibility for this conversion. It would give them a slightly different look, but certainly doable. Wow! I'm really hoping GW took notice of this model for the expected release our new dex (Templars). Rumor has it that chappys will play a greater role in our crusades...I would LOVE to get one of these guys as a centerpiece Reclusiarch for my BT Crusade. If they don't have any comparable for purchase, I may just have to hit you up for one of these! Amazing work! Philsminions: Thanks! Hopefully they give Chaplains a bigger effect in the new book. That would be cool.